AMES, Iowa — Lois Wright Morton, an Iowa State University sociology professor, today accepted the U.S. Department of Agriculture’s National Institute of Food and Agriculture Partnership Award on behalf of the Climate Change, Mitigation and Adaptation in Corn-based Cropping Systems team, which she directs. In March 2011, Wright Morton convened a nine-state, 11-institution partnership to discover, engage, publish and teach strategies farmers can put in place throughout the Corn Belt to make corn-based cropping systems more resilient to current and predicted impacts of climate change. Project participants included 140 scientists, 86 graduate students, 133 undergraduates and 18 extension educators and outreach watershed coordinators. Thirty percent were affiliated with Iowa State. In addition, 159 farmers partnered with team scientists and educators to share their knowledge and learn from project research. The United States produces 41 percent of the world’s corn, of which more than 60 percent is grown in the upper Midwest. An increasingly variable climate and increases in frequency and intensity of rainfall in the Corn Belt threaten crop production and degradation of soil and water resources. The project was funded for five years by a $20 million USDA-NIFA grant. Wright Morton and her team sought additional institutional partners and obtained an additional $25 million to expand the project’s research to include soybean production, impact of practices on crop pests and disease, water use efficiency in organic corn production and social-economic factors that promote or impede adoption of the management practices being studied. Research data, from the management practices being studied, were collected over five years from 35 field research sites in the Corn Belt and were integrated with climate science data. The management practices were evaluated by multi-disciplinary teams of project researchers. The practices were: corn-soybean rotation, cereal rye cover crops within the corn-soybean rotation, extended and diverse crop rotations, organic corn cropping systems, drainage water management, canopy nitrogen sensing, tillage management (no-till and conventional) and landscape position. Results included 119 scientific findings and 59 recommendations. Research findings have been reported in 154 refereed journal articles, 212 extension publications and 995 presentations to farmers, farm advisers, K-12 educators and others, resulting in a total audience reach of approximately 90,000 individuals. All findings and recommendations are being compiled into technical reports for future use by scientists, farm advisers and extension educators and administrators. Educational publications and videos for agricultural stakeholders and educators have been made available through Midwest Regional Climate Centers; the National Council for Science and the Environment’s website for K-12 educators; and Midwestern, land-grant university extension online stores, (for an example, see http://store.extension.iastate.edu/Topic/Crops/Climate-and-Agriculture). The project’s database and infrastructure are being extended as project investigators develop new teams and build on the research. The database houses some of the most comprehensive systems-level data collected on Midwest agricultural systems and will be made public in 2017 at the USDA National Agricultural Library. Participating institutions included Lincoln University; Michigan State University; Ohio State University; Purdue University; South Dakota State University; University of Illinois; University of Minnesota; University of Missouri; University of Wisconsin; and the USDA Agricultural Research Service in Columbus, Ohio. Participation in the project launched the careers of many of the graduate students. To learn about what they are doing now and to learn more about this project, see www.sustainablecorn.org. 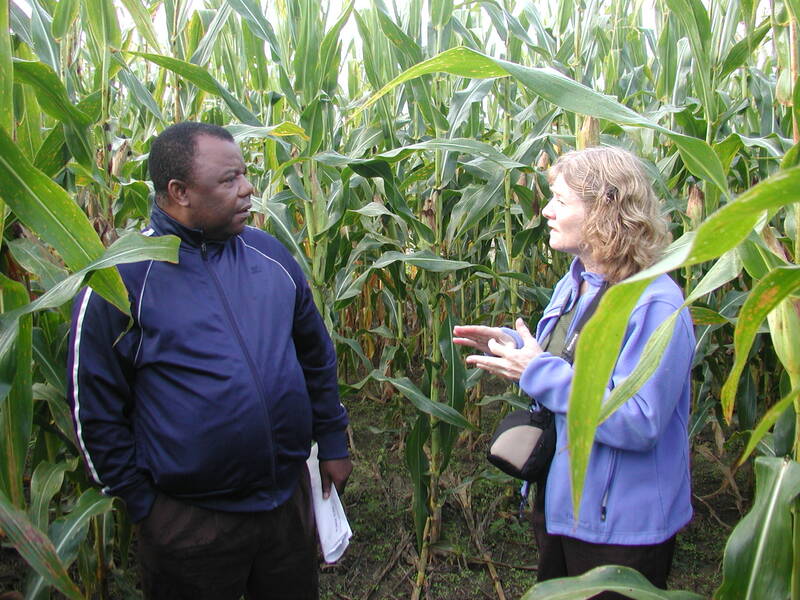 Lois Wright Morton (right) discusses corn-based cropping systems research with Nsalambi Nkongolo. Nkongolo, environmental sciences professor at Lincoln University, was one of 140 scientists on a research project directed by Wright Morton.